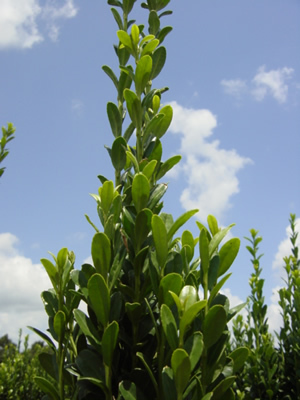 Ilex crenata ‘Sky Pencil’ is a densely branched evergreen shrub that has a tall columnar growth habit and can get 6-10′ tall and only 2-3′ wide at maturity. This Japanese Holly was discovered by Norihiro Shibamichi on Mount Daisen, in Honshu, Japan. This Holly was brought into the US by the National Arboretum’s Elite Plant Program in 1985. ‘Sky Pencil’ is a female selection producing small white flowers in the spring and inconpicous berries in the fall. Does best on a well-drained sandy soil that is slightly acidic. This is a great plant for formal gardens or for gardens with very little space.